Edelweiss Perennials. Arisaema candidissimum lg. Bare root corms - shipped January though mid May only. 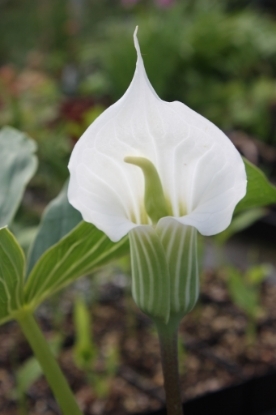 One of the most unique and largest-leafed cobra lilies, yet easy to grow. 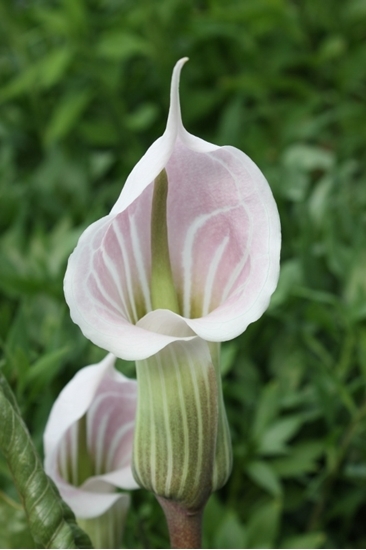 The flowers are pink with white stripes, the 3-lobed leaves can reach over in 2' diameter. Grows into sizable clumps over time and can be divided for sharing. Emerges very late; late May into June, but once it emerges, things go fast and the plant goes into leaf and bloom at the same time. 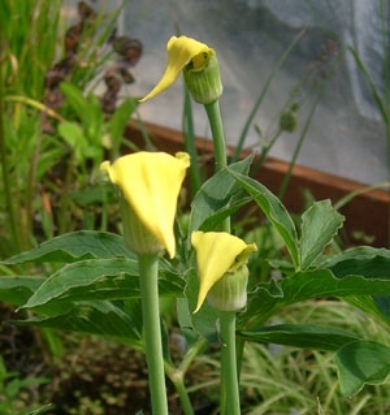 Grows well in shade where summers are hot (90s +) but takes quite a bit of sun in cooler climates. Needs well drained soil and don't give extra water until they sprout. Large, blooming-sized corms, 1-1/2" to 2" in diameter, suitable for a 1 gallon pot. Botanical Name Arisaema candidissimum lg.